Military spending by various countries all over the world can be measured as each countrys spending percentage of that countrys gross domestic product. A countrys GDP is a total of the value of the services provided in a country and the products that are made there. It does not include the value of items that are imported into that country, but it does include items that are made in a country and exported out of it. The GDP of a country is often considered to be a good indicator of that countrys standard of living. In general, the Middle East has the highest amount of military spending when compared to the GDP of the countries in that region. Africa is a mixture of countries that spend little and countries that spend nearly as much as the Middle East when compared to their own GDPs. Europe and the Americas spend in the mid range with Mexico and most Central American countries spending the least of these countries when compared to its GDP. Australasia and East Asia are also in the mid-range with Japan spending little compared to its GDP. 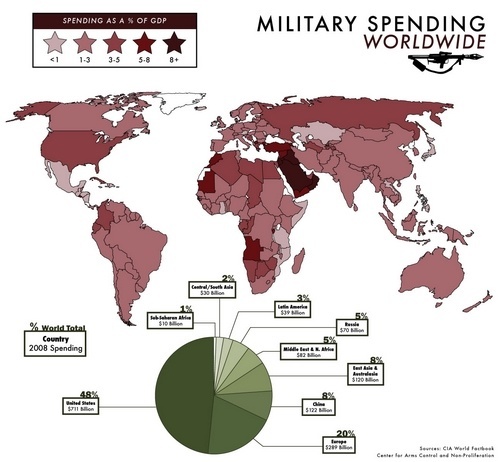 World MAP illustrating percentages of total budgets allocated for Military, Healthcare and Education.